The Delaware Higher Education Office has recently launched the Delaware Goes to College website. It is designed to be the resource for families and students to navigate the college planning process. Most of the website consists of links to other websites including The Delaware Alliance for Community Advancement that offers a Financial Aid University program. You can probably avoid clicking on most of the links by just downloading the Delaware Scholarship Compendium PDF. This 60 plus page publication provides an overview of financial aid, including sources and how to apply as well as a chart showing the value of a college degree. It has a section on choosing your college which lists questions to ask yourself as well as the college and factors on which to compare schools. Readers will find the usual college planning timeline but only for the senior year. The bulk of the document is the listing and description of scholarship programs, general and state specific. You can look up the scholarships by deadlines or alphabetically. The last section covers Delaware Financial Aid Programs including how to apply, incentive programs, and information on the Academic Common Market. The Delaware Goes to College website isn’t yet a replacement for the Delaware Higher Education Office website which is where Delaware students apply for financial aid. It also includes information on regional partnerships. The other site you may want to visit is the College Loan Consultant. Users will find information on Delaware specific professional incentive programs with special loan repayment provisions. The website also provides a variety of loan calculators and financial aid information. It does not provide student loans for Delaware. There are four Delaware colleges (public and not-for-profit) with 500 or more full-time undergraduates. Two are private colleges and two public universities according to the Integrated Post-secondary Data System. Of the 25,356 students, 19.4% attend private colleges and 80.6% attend public universities. 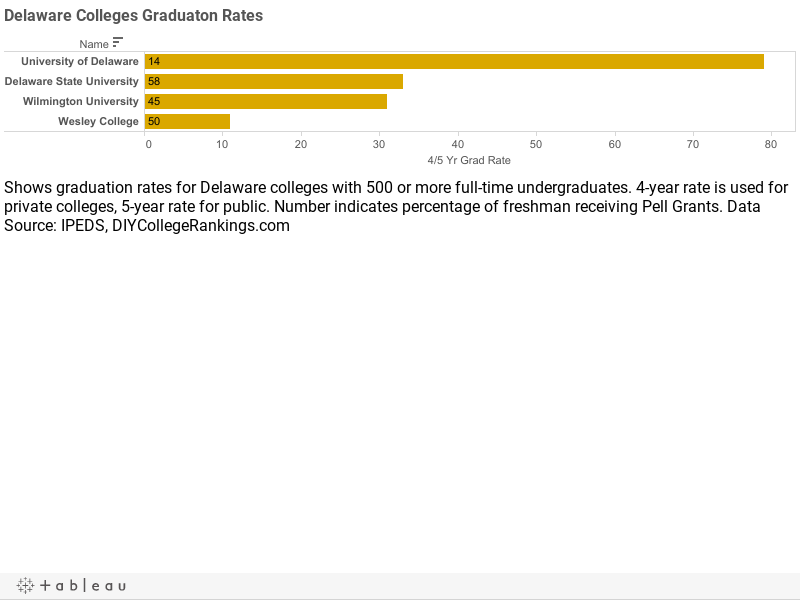 The average four-year graduation rate for private Delaware colleges was 21% and the average five-year rate for public schools was 56%. One university meets the DIY College Rankings 50-50 profile requirements. The average SAT score for college-bound seniors in Delaware was 456 for Critical Reading and 459 for Math. The 75th percentile scores were 530 for Critical Reading and 540 for Math. Of the three schools that reported SAT scores, only one had 75th percentile scores equal to or higher than the state average in both categories.